If you are planning your wedding and want a destination wedding in a unique country with beautiful landscapes and venues, consider Georgia. The state located at the crossroad of Europe and Asia offers a mixture of both, that is reflected in its culture, traditions, and architecture. 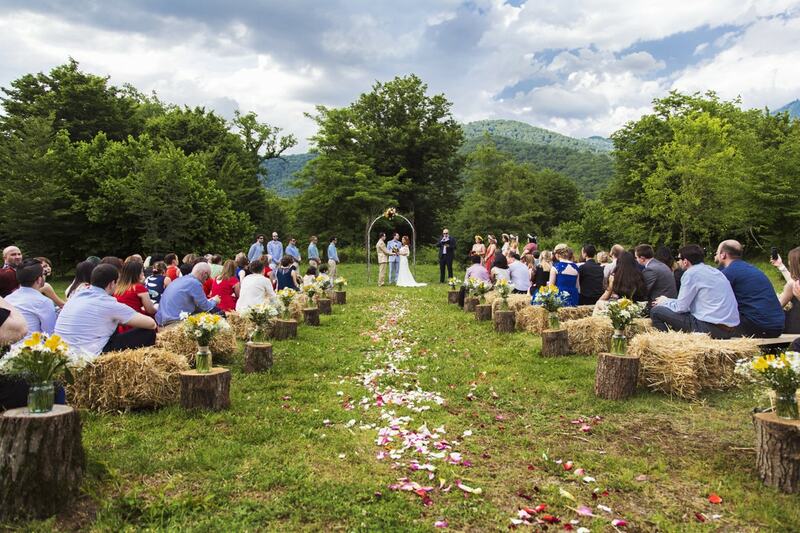 However, if you are looking to host your wedding in nature, Georgia won’t disappoint you either. Mountains, vineyards, lakes, remote villages with medieval defense towers, castle-like resorts and chateaus, and the Black Sea is where you can bring your guests and have a beautiful destination wedding. The capital of Georgia, Tbilisi utterly shows the juxtaposition of modern and ancient architecture. With so many venues to choose from, the city also offers a wide range of perfect locations for the photoshoot. Narrow cobblestone streets, a botanical garden, the colorful wooden curved balconies Tbilisi is so famous for, ancient defense fortress, and gorgeous views of the city is what will make your wedding here so special. Tbilisi’s old town offers a wide variety of places to have a gorgeous photoshoot. Its dome-shaped sulfur bath tops, ancient walls, and centuries-old buildings are there to create beautiful memories of your wedding. Botanical Garden, also located in the Old Town, occupies 161 hectares and features a collection of more than 4,500 different species of flora. It makes for a perfect location for those who are looking to have a shoot in nature but also be close to the city. 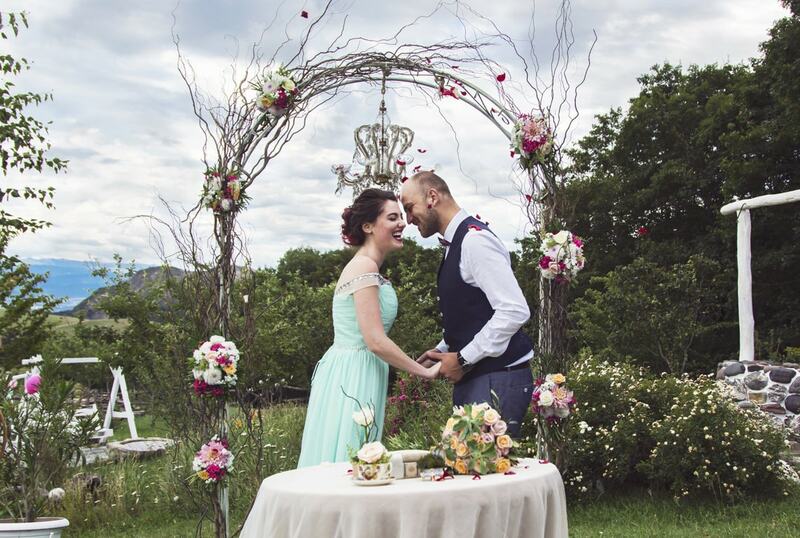 Giorgios Ranch, located just outside of Tbilisi, is a perfect venue for those who would like to have a relatively small spring or summer wedding, where you can also stay overnight in a small ranch together with your guests. Couples who love sports, and football in particular, can have their beautiful wedding photo shoot at the Dinamo Arena in Tbilisi. With a capacity of 54,549, the stadium is the largest in the country. Tbilisi doesn’t have a sea, but there’s a big reservoir that locals call the ‘sea’. Located on the outskirts of the capital, the Tbilisi Sea Club offers a great venue for your wedding. Moreover, you can hire a yacht and have a spectacular entrance on this special day. Mtskheta is one of the oldest cities in Georgia as well as its former capital, boasting history and culture. It’s a popular wedding destination for locals offering beautiful scenes for a photoshoot. Besides, there are a lot of venues and restaurants where you can host a dinner. Kakheti, an eastern part of Georgia, is another popular wedding destination for both locals and those who host destination weddings in Georgia. Kakheti is home to some of the beautiful chateaus, where you can stay with your guests, and have a dinner and a photoshoot in the venue area or its vicinity. With its castle-like hotel, Chateau Mere offers an outdoor pool, big dining hall, wine cellar, and several Arabian horses if you’d like to add a unique touch to your wedding. 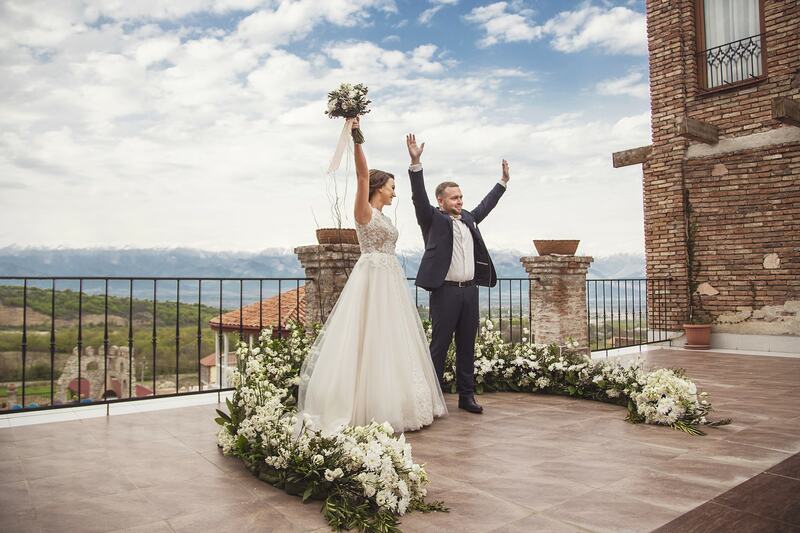 Royal Batoni, another castle-like venue in Kakheti, is another popular wedding venue, with a small infinity pool, a terrace and a stunning view over the Illia Lake. Located in between of Duruji river and Kvareli mountains, Royal Batoni is only 146 kilometers away from Tbilisi. The interior of the hotel is designed with a mixture of modern and traditional architecture which will add a unique touch to your event and photos. The surrounding scenery is beautiful in any season of the year. Kvareli Eden is a hotel complex located 135 kilometers from Tbilisi. The high-class rooms, big area, vineyards, wine spa, entertainment rooms, and an outdoor pool is what awaits you here. 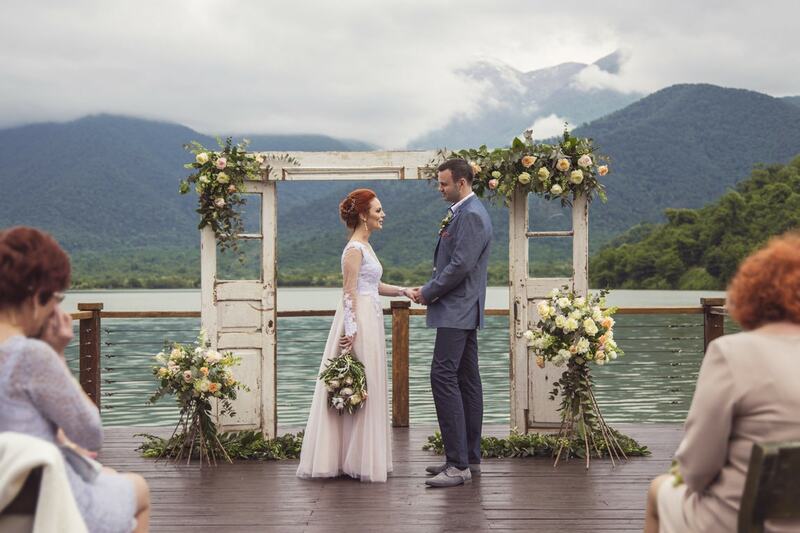 If you are looking for a venue that overlooks a lake, then Kvareli Lake Resort should be on your list. Located beneath the slope of Great Caucasus Mountains, the resort is set on 300 hectares and offers beautiful views not only over the lake and the mountains but also of the forest and Alazani valley. Moreover, each of the rooms has a small terrace overlooking the Kvareli Lake, so your guests will enjoy each moment of staying here. Chateau Mukhrani is the former palace of Mukhrani family, a stem of one of the oldest royal dynasties of the world—Bagrationi. Now a winery, the venue is a popular wedding destination for both locals and visitors. With its white castle, huge courtyard, and vast vineyards, the area offers gorgeous scenery for open-air summer and spring weddings, or a photo shoot location where you can also hire a horse for an added touch to your photos. 🍷Georgia is one of the oldest wine regions in the world. Almost every family here grows grape and makes wine. Some just for own consumption, for some it's a good business. 🍇Grapes grow everywhere, even in the city there's no street without grapevines in a garden. Imagine wine regions! The main is called Kakheti. There are many interesting venues for your wedding in here. Imagine a ceremony overlooking endless lines of grapevines in the sun, then light cocktail and photo shooting and a nice family dinner afterwards. It's all possible here. Just let us know and we will find a perfect for your couple place. 🍷Грузия – один из старейших винных регионов в мире. Практически каждая семья выращивает виноград и производит вино. Кто-то для себя, а для кого-то это основной бизнес. 🍇Виноград здесь растёт везде, даже в столице нет улицы без уютного дворика, покрытого виноградными лозами. Только представьте, как выглядят винные регионы! Основной здесь – это Кахетия. Здесь же находится множество интересных площадок для свадебного торжества. Просто представьте церемония регистрации брака с видом на бесконечные ряды виноградных лоз, затем легкий коктейль, вспышки фотокамер и, наконец, семейный ужин как завершение торжества. Все это абсолютно реально здесь, в Грузии. Свяжитесь с нами и вместе мы найдём площадку, идеальную для Вашего торжества. Stepantsminda, a small town in northeastern Georgia, is the center of the Kazbegi Municipality. The road to Stepantsminda from Tbilisi follows the Georgian Military Road that leads to the Russian border. On the way, there’s a Georgia-Russia Friendship monument built in 1983. The area offers splendid views of the Caucasus mountains. 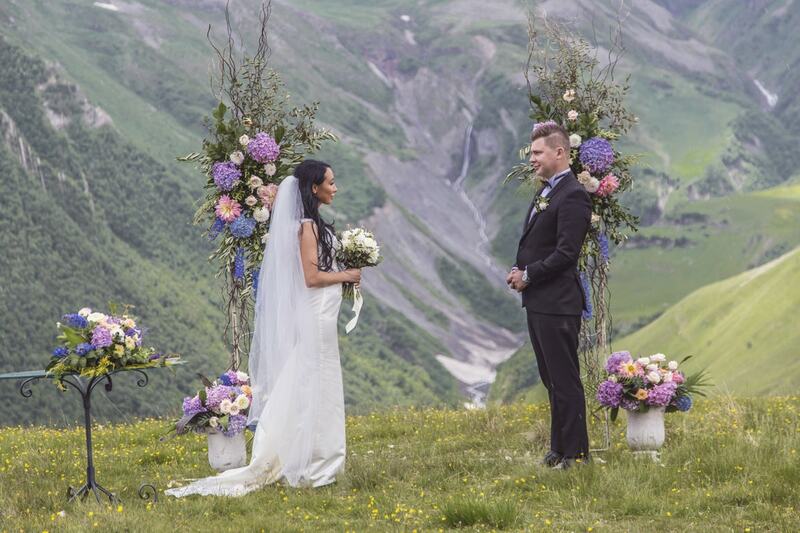 Therefore it’s another favorite wedding destination for those who would love to pronounce their vows in nature. Stepantsminda, also often referred as Kazbegi, is home to a Rooms Hotel that offers a gorgeous terrace with the view of Mount Kazbegi. Because of this view, the hotel is a popular destination for both leisure and weddings. Gergeti Trinity Church, located just six kilometers from Stepantsminda, offers a beautiful landscape for your photoshoot as it’s located at the elevation of 2,170 meters above sea level at the foot of Mount Kazbegi. Are you looking for a wedding destination by the sea? Then consider the Black Sea coast. There are plenty of restaurants and hotels to host your dream destination wedding. Besides, you can book a yacht here and have a small tour of the sea or a gorgeous photo shoot at sunset with the view of Batumi, one of the central cities of the area. Overlooking the Black Sea, Castello Mare Hotel is one of the most beautiful wedding venues in the region. You and your guests can enjoy a gorgeous courtyard of tropical plants, a spa zone with various treatments, Eucalyptus steam room and a Roman bath to name a few. Similar to Tbilisi Botanical Garden, Batumi’s garden is full of exciting and unique flora. Located just 10 kilometers away from Batumi, the garden is considered to be one of the biggest of its type in the former Soviet Union. Svaneti is the most rural areas of Georgia, offering breathtaking views of some of the highest mountain peaks of the Caucasus, vibrant culture, and ancient defense towers. 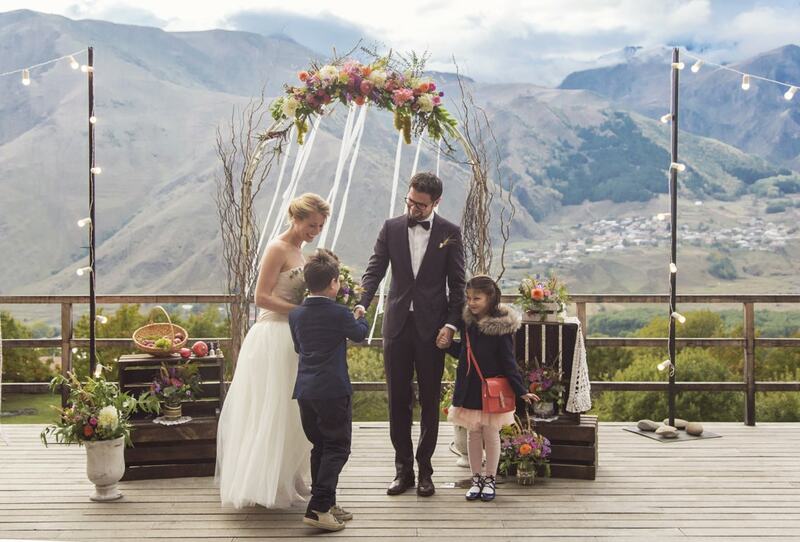 If you are looking for a very special location to host your wedding and surprise your guests, you should definitely consider Svaneti as your wedding destination.